Students and teachers have organized a series of demonstrations against the expansion of charter schools in Chicago. Hundreds of students, along with their teachers, walked out of their Chicago high school on October 28 in a protest against proposed charter schools. The students say that these new charter schools will end up draining resources from already-underfunded neighborhood schools. “I fear that our public schools don’t have enough resources, and they deserve more funds to grow current programs,” high school senior Stephanie DeLeon told DNAInfo. The students attend Thomas Kelly High School in Brighton Park, a neighborhood in southwest Chicago. Just a few blocks away, on a now-vacant lot, the Noble Network of Charter Schools wants to build a new high school capable of taking in 1,100 students, along with a good amount of funding, from surrounding schools. The Noble Network, which allegedly has close ties to the president of Chicago’s Board of Education, insists that the area needs a new charter school to serve the thousands of kids who currently attend Chicago Noble Network schools but have to travel outside of their own neighborhoods to do so. The walkout occurred on the same day the Chicago Board of Education was set to vote on 13 proposed charter schools. The students left their classes in the afternoon, made their way across the street to Kelly Park, and had a speakout about what the new charter schools would mean for their school. The students then marched around their school for about 30 minutes before their principal asked them to come back to class. Some tried to hop on the bus to the Board of Education meeting. Others stayed at the school and waited for news cameras to arrive. That morning, hundreds of students from high schools around Chicago counter-protested a pro-charter school demonstration outside of Chicago Public Schools, or CPS, headquarters. Anti-charter school protesters from the Chicago Teachers Union also showed up to CPS headquarters dressed as zombies. Kelly students also held a rally on October 26 outside the offices of Alderman Edward M. Burke, a local politician who has openly supported the charter schools. Donning face paint usually worn on Mexico’s Day of the Dead, symbolizing the teachers who have been fired and the programs that have been underfunded due to recent budget cuts, the students, along with their marching band, made their way to Burke’s office, arriving at around 4 p.m. The alderman’s offices were closed by then, but hundreds of students had come out and rallied nonetheless. 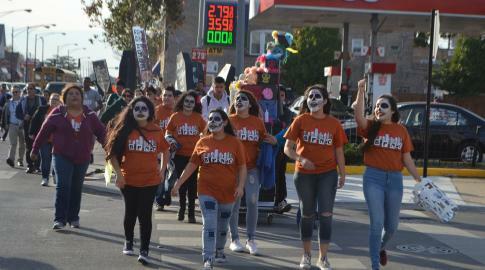 Students from nearby Gage Park High School also rallied in late September against the proposed Noble Network charter school as part of a larger campaign started in late July by more than a dozen public schools and community organizations. Outside of Wednesday’s Chicago Board of Education meeting protesters from both sides of the issue confronted each other while people testified for and against the charter schools on the inside. “By eliminating the expansion of charters, you are taking away our freedom of choice,” Stephanie Bassett, who has three kids currently attending charter schools, told the board. Students protesting outside the meeting faced-off with pro-charter school protesters in a series of chants and then marched up and down the street. Students then staged a study-in where they all sat on the sidewalk and did their homework and studied. Despite the long campaign against the Noble Network school, the Chicago Board of Education ended up approving it along with a new Knowledge Is Power Program, or KIPP, charter school in the Humboldt Park neighborhood and the expansion of an existing KIPP school in the Austin Park neighborhood. They also rejected a number of the proposed schools and put 10 existing charter schools on an academic warning list requiring them to submit a written plan of improvement.